In the Jewelry Hallmarks Guide, we will describe jewelry hallmark in details. Jewelry hallmarking on precious metals has a brief history. It was a form of consumer protection in old Britain. Edward I was first requiring hallmarking. Now, different country has different hallmark identity. American gold hallmark, Italian gold hallmark, Indian gold hallmark etc. Is it only for gold? Not at all. Hallmark is different for different metal. Besides gold jewelry, silver has a hallmark. Even antique gold has a hallmark. What Does Jewelry Hallmark Denote? What is mean by Carat and Karat? How to get jewelry hallmarked? Why Need Hallmark in Jewelry? Hallmark is the identification and indication of the purity of jewelry metal. If you can read the hallmark on jewelry, you easily can understand the quality of metal, when it was made and where it was made. You can also say it is like the maker’s brand staple on jewelry. I hope you understand what is it. Simply, The Hallmark is a process of certification by the authority to ensure the purity of jewelry metal. Jewelry hallmarking has a brief history. You can check it here. A standard hallmark denotes all history of the metal. It denotes the logo or code of the jeweler means who made this, what is its standard of fitness, the year in which the article marked. Furthermore, it must denote the purity in KARAT, Assaying Center Identification Mark and BUREAU of Country standard logo. Carat: This is a popular word used to describe diamond weight. It refers to describe the weight of gemstones and A Carat equals two hundred milligrams. Karat: Karat is a unit used to estimate the purity of gold. 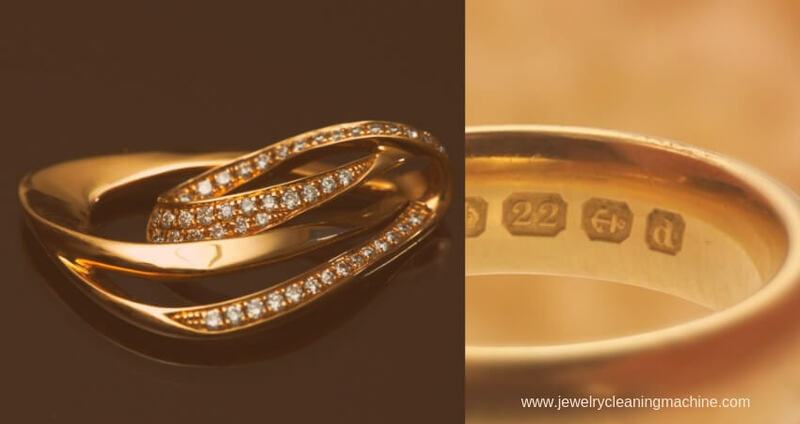 We see different types of gold jewelry as 24 to 18 karat. You know, jewelers cannot create jewelry with pure gold. They need to mix it with second bonding metal. If you can see of 18 karat gold written in your jewelry hallmark, it means you jewelry has 6 parts alloy metal. As 24K is standard pure gold. Now jewelry business owner has the right to take a decision where he is going to hallmarked or not. But hallmarking will build your brand value. If you like to hallmarks your jewelry, you can start the process by sending your jewelry to an Assay office. 4. Then the Assay Office will add their identical mark. So anyone can understand which Assay Office provide your hallmarks. It is not only the form of consumer protection, but it will also increase the company brand value. Hallmarking on jewelry came in the USA whenever the mass production and sales began. In 1961, the National Gold and Silver Stamping Act1906 published in the USA. While hallmarking precious metal started since the 1300s in the UK. Whatever, if you like to increase your business as a brand, you need to hallmark your jewelry. It is an official stamp of quality. So customer trust hallmark. What is well for both the business owner and customer. Anyone cannot misuse of hallmark. Gold jewelry hallmark or purity marks on gold is denoted by the letter K or three-digit letter. It can be a little bit confusing. Because there are different types of hallmark and each of them can appear on your gold. We said above, pure gold is 24 Karats what is denoted as 24k. It can be also stamped as 999. We write other hallmark lists in below. The hallmarking policy is the same as gold but hallmarks and signs are different. You know, silver has a different quality. Different quality has a different name and different hallmark code. The pure silver is denoted as silver but when it mixes with another metal and made create sterling silver, coin silver, brittania etc. Buying hallmark jewelry is safe. That’s why always check a jewelry hallmark before purchase. But for a certain weight, it may not have hallmark and it is ok. If you buy gold jewelry which weight is less than 1g, there will no hallmark. Similarly, for silver the weight limit is 7.78g, platinum is 0.5g and palladium 1g.